Women of WNC: Compassion to the Rescue! We just had to share these cuties with you. 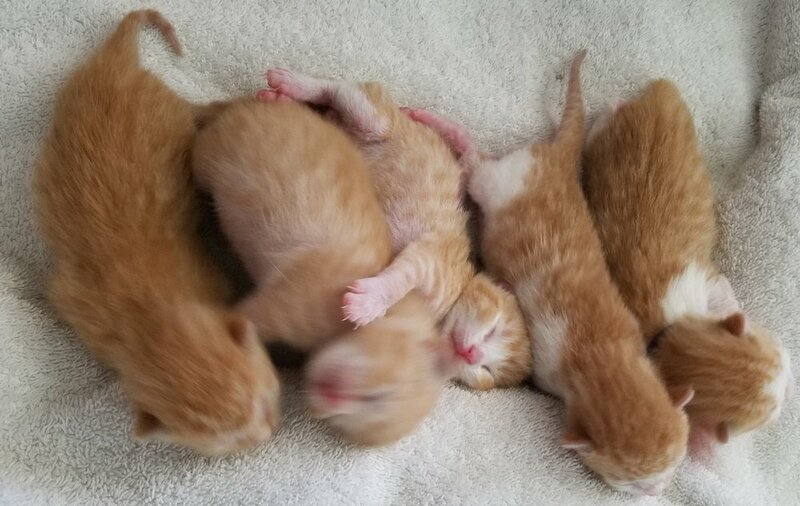 They are only 2 weeks old and will be available for adoption around Christmas. We will have more info on names and sexes available shortly. They have just moved into their foster home. You can pre-apply for adoption. Reference Kelli's kittens on the application. Whew! Hard Excercise Works Really Works To Get Pets Adopted! Thank you to the folks at Hard Exercise Works for hosting our adoption event. Our sweet Ghost puppy is heading to a wonderful new home. All the puppies, kitties, and volunteers at Mountain Pet Rescue Asheville want to send a big THANK YOU! to Leslie Woodruff of Woodruff Photography for taking such awesome pictures of our adoptable animals. Thank you to Fleetwood's and Rusty's Legacy, and everyone that supported us during our yard sale yesterday! We made over $500!!! Between all three of our yard sales, we've raised nearly $2,000 which will cover some of our animal medical costs and spay/neuter, the fee for applying for our 501c3, and a few other miscellaneous expenses. We truly appreciate all of your donated time, items, and love!! Thank you all again!